contempt for wind farm neighbours the big thumbs up. ‘Wicked’ and ‘wanton’ doesn’t quite capture the manner in which wind power outfit, AGL behaves towards its victims. Spearing hundreds of these things into the heart of (once) peaceful and prosperous rural communities would be bad enough, but treating those that suffer the consequences – such as the chronic sleep deprivation caused by incessant turbine generated low-frequency noise and infrasound – with merciless ridicule and contempt takes their corporate mantle into the realms of the despicable; or, in the language thrown around in Australian pubs: ‘first class mongrels’. 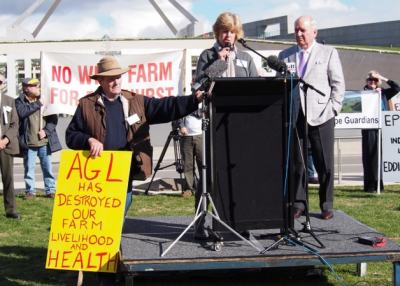 It’s a tag well-deserved – as 2GB’s Alan Jones lays out in this interview from 23 September with one of AGL’s most stoic victims, STT Champion, Annie Gardner (audio link below with transcript following). Alan Jones AO: We are in debt aren’t we as a nation? I think so. $40 million a day in interest on the debt. Malcolm Turnbull on the other side of the world wants to bring in Central American refugees currently in a resettlement centre in Costa Rica, so he said. Costa Rican refugees, they’re not fleeing any war. Costa Rica’s not Syria. They’re not hunted by Islamic-state killers as is the case in Iraq. They’re not being overrun by brutal militias. These are economic refugees just looking for better pay and better welfare. Better than they can get in Central America. Since when were we in the business of taking on board economic refugees? It’s not our role to open our borders to thousands of these people. We are already going to bring in 12,000 Syrian refugees. $830 million that will cost us minimum over four years. So we keep bringing in more when those we brought in can’t integrate. The last three terrorist attacks here were all by Muslim refugees. Malcolm Turnbull on the other side of the world said, “We’re going to have a high refugee intake.” 19,000 a year and that doesn’t include 12,000 Syrians. And those who are here can’t integrate and this is money. We’ve still got a Middle-East organised crime squad in New South Wales. I mean this is money. The amount of energy we are going to get now and in the future from solar and wind is so inconsequential it’s not worth contemplating, but it’s costing you the taxpayer the earth. The primary source of our energy will be fossil fuel. Simple as that. That’s coal primarily. We’re wasting billions of dollars of your money destroying peoples’ lives with this renewable energy nonsense. Let me explain. There was a Senate committee report in to wind farms tabled in the Federal Parliament last August. It put forward a range of measures to curb wind farms. The Parliament’s taken no notice. It recommended that subsidies to new wind farms be limited to five years rather than the current period of 20 years. Note those words. Subsidies to wind farms. We just had Christian Porter, the Social Security Minister saying, “We’ve got to tie up and tidy up welfare.” Not a word about corporate welfare. Does the mechanic listening to this program or the baker or the taxi earner get subsidies from the government? Why should foreign-earned wind farms get two cents? But the Clean Energy Council says, “Well, if you limit wind farm subsidies to five years, you’ll destroy the future of the industry.” I wish. How can an outfit make any sort of claim to commercial viability if it can’t survive without 20 years of taxpayer’s money? Amid the recommendations this Senate Committee last year put a proposal that an independent scientific panel be established. They would have the power to block new projects being registered by the government if it believed human health was at risk. The guidelines would include, this is the Senate Committee’s report on wind farms, that investigation be made and assessment provided for infra-sound, vibrations, aircraft safety, indigenous heritage, birds and bats. This is about these damned wind turbines, and it went on. But you see, the point is wind farms were approved without any of those issues being considered. This is one of the biggest rorts in this country. Taxpayers paying millions a dollars a day in interest and billions of dollars to foreign-owned wind farmers. Canberra is in bed with this lot. All because of carbon dioxide. All because we’ve got a problem with carbon dioxide. The amount of carbon dioxide in the atmosphere is .04 of all gases. 97% of all of that is naturally-occurring. Only 3% is caused by human activity and one-and-a-bit by Australia. This is costing us billions and billions of dollars. There is already a backlash against this stuff in Britain and Germany where electricity prices are going through the roof as a result of an emphasis on renewable energy, which is many multiples dearer than coal-fired power. Tony Abbott prime minister said he wasn’t going to chase Holden down the road with a blank cheque. Why are we chasing foreign-earned wind turbine companies up the road with blank cheques? I’m inundated with correspondence on this. We’ve got ground-breaking research from Germany, which tells us that the impact of the noise of these things, low-frequency noise, is poorly understood. There’s a study of 45 people by Tehran University which said this, “Despite all the benefits of wind turbines,” and I don’t, I’m not sure there are many, “It can be stated,” the study said, “that this technology has health risks for those exposed to its sound.” Neil Kelley at NASA in the 1980s, National Aeronautic Space Agency, had modelled these early wind turbines, came to the same conclusion. A direct link between this infrasound … I’m saying this because how would you like to live next to these things? A direct link between the noise, the frequency noise and the health problems of neighbours and yet we’re increasing these wind turbines everywhere. Queensland, Victoria, New South Wales. The German research said this and Frydenburg and Co. in Canberra, don’t want to know about it. They’re towing the left-wing line. Renewable energy demonising coal-fired power. The German research said this, “Although common declared as non-audible, the number of complaints about infrasound exposure has been increasing exponentially in Germany and in other countries, ‘Serious problems exist’.” The German project leader Christian Cox said, “It’s been agreed that infrasound is perceived by human beings and it represents an unknown hazard to human health.” Extraordinary. Anne Gardner lives next to them – the Macarthur wind farm in western Victoria. Not one person listening to me would want to be in her shoes. It will be a miracle if when I speak to her in a moment she doesn’t burst into tears, except she’s a tough lady. The Macarthur wind farm is AGL Energy. Let me say to you, they are mongrels. Absolute mongrels. 140 turbines, 150 metres high, 56 metre blades. The biggest monster in the southern hemisphere. The closest turbine to her property is 90 metres. She’s been fighting this for eight years. She is now a refugee in her own home. She has to leave in order to get some sleep and this has resulted in one major tragedy already. She’s been bullied and intimidated in the most incredible manner. She’s on the line. Anne, good morning. Annie Gardner: Good morning Alan. Alan Jones AO: Your business has been destroyed, you and your husband Gus. Annie Gardner: That’s correct, yes. That was destroyed just with construction at the Macarthur wind farm before the turbines started operating four years ago. Alan Jones AO: This family had a shedded sheep enterprise which produced the finest wool in the world. In fact, Zegna in Italy awarded the Gardners second prize in the Zegna of Italy Award for Australia and New Zealand, recognising the Gardner family product as the second-best fine wool in the world. The sheep couldn’t handle the noise. You had to close the business. Annie Gardner: Actually Alan, it wasn’t the noise during, well there was noise during construction, but the main issue was dust contamination. Alan Jones AO: Dust as well, yes. Annie Gardner: Over about five months and it contaminated their drinking water and they were literally poisoned. That was the end of that enterprise which we’d put a lot of money into and had hoped that our daughter and son-in-law would come home and run it when it got too much for us also. That was finished very quickly. Alan Jones AO: Fast forward to now and Anne Gardner and I have been corresponding. This is appalling stuff. You wrote on the 12th of September to this Andrew Vesey. Mr. Vesey, I don’t know much about you but I know enough to know that I can say you must be a horrible piece of work because they don’t even answer correspondence, he’s the Managing Director of AGL. Anne Gardner wrote to say, “This is my sixth letter to you requesting AGL forward to me a copy of AGL Lighting’s complaint register. Now, just to explain to our listeners, part of the provision for all of this is there meant to be a complaints register and you’re wanting to check if AGL Lighting’s compliant register corresponds with the number of complaints have been forwarded during this horrific six months of dust inundation to your property during construction. So you said, “Well, what is on the register with the Moyne Shire whereby to comply with the Environmental Management Plan.” AGL is required to forward notification to the Shire, local government, of all complaints during construction to this responsibility, the Moyne Shire. Annie Gardner: Actually, Alan I’ll interrupt there because I did receive it this week but it was quite small and didn’t actually have the reports of all the e-mails of complaint we’d actually sent to AGL. Alan Jones AO: You said to him, “I’m enclosing,” now listen to this my listeners, “a copy of my 174th complaints to AGL, in order that you and your directors may learn about the very serious nature of the manner in which your company’s industrial development has impacted on our life.” Now you told me a story that on Monday the 5th of September your husband and you were driving to your destination, you fell asleep at the wheel. Annie Gardner: That’s what happened. Alan Jones AO: Yeah. You are sleep-deprived and tell us what happens when you wake up in the morning. Annie Gardner: When we woke up in the morning, we just feel as if literally we’ve been run over by a truck because we’re still exhausted. We’ve been in bed for hours. We’ve had a very light sleep and sometimes hours awake at night because it’s like sleeping in a pressure chamber in our bedroom. We feel the vibration through the bed as if your body is being electrocuted and the pressure in ears and my nose, in particular, it cracks. And we have a constant headache. So we wake up with those symptoms and so that the longer you stay there, the more noisy it becomes, so then I just have to get out of bed and, yeah, sometimes I actually reach for the Panadol to try to make the start of the day a bit more less painful. Well, already a neighbour of yours and this is very tragic because a whole stack of families have complained and you’ve made AGL aware of the awful tragedy that a neighbour was tragically killed in a horror crash several weeks ago. She was sleep-deprived. She had complained to AGL about her problems with sleeping but she told you that AGL did not and would not do anything to help her. She’s lost her life. Alan Jones AO: And she fell asleep. Fell asleep at the wheel. Alan Jones AO: And you’ve 52, I think, complaints to AGL, environment protection agencies, government, the Baillieu government. Now the Andrews government, the Abbott government, the Turnbull government and no one does a thing. They’re in bed with them. And the people listening to you now, Anne, are subsidising all of this. They are subsidising the inconvenience, the damage to your health that you are enduring. You wrote to me only this week and Anne said, “I’m sorry Alan to keep on like this but I find the prospect of having to leave so distressing.” You know now we have to fight and get these bastards. Well, we’ll keep fighting, Annie. You try to hang in. I hope by letting other people know of the problem, we’ve gone somewhere towards resolving it. Good luck. Annie Gardner: Yes, thank you very much Alan. We appreciate your assistance. Alan Jones AO: Not at all. Annie Gardner: Because nobody else is helping us and we’re just out there crying for assistance. Alan Jones AO: I understand. I understand Annie. Anne Gardner. Alan Jones watches Annie Gardner in action, Canberra June 2013. Anyone who reads this and isn’t truly moved by this woman’s story and enraged by the lack of ethics of those who are responsible have ‘lost their moral compass’. In Ontario, we have Alberta teacher’s benefitting through the Alberta teachers’ pension fund, from the grief and distress of rural people who are being forced to live too close to turbines because they were sited near their homes, against their will and without their consent. 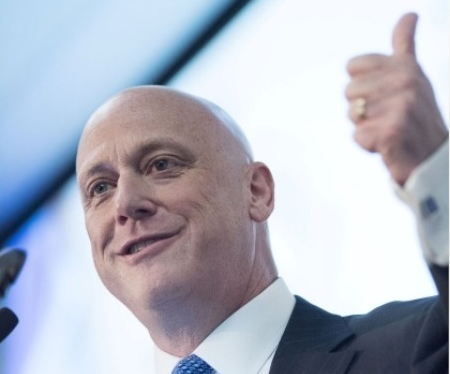 As one once proud to work on development projects for AGL I find it extremely distasteful to witness the current callous indifference displayed by that company’s senior executive in their zeal to exploit legislation which, unless they are utterly incompetent, they must realise is manifestly against the interests of ordinary Australians. It simply doesn’t wash to suggest that just because this flawed legislation exists that makes it OK for AGL to pile on board and become yet another wind industry rent seeking parasite. The ongoing disgraceful treatment of the victims of AGL’s callous indifference only serves to confirm our decision made a few years back too divest our super fund of this once great Australian company. OK when profit is earned on the basis of real production, good, but when it’s based on the gaming of artificial, politically inspired market that undoubtedly will do untold harm to ordinary Australians, then we had no choice Mr Vesey but too “spit the dummy”. AGL and the many other corporate-welfare-dependant (foreign owned) industrial wind farm monoliths are *absolute* mongrels. Foreign owned mega companies; surviving, thriving and competing (only) through subsidies, blood-sucked from the taxpayer via eco-brainwashed governments, resulting in the complete destruction of the lives and livelihoods of hard working taxpayers, like those of Anne Gardner. This incredibly sad story needs to be shared far and wide, highlighting the true damage done to the environment and its inhabitants, both flora and fauna, in the virtue-signalling name of “Saving the Planet”.